The Linear Collider Board is the main decision body to promote and oversee the linear collider and its detectors as a worldwide collaborative project. In Europe, a new body, the European Linear Collider Forum has just been launched to channel European discussions concerning the ILC and CLIC and to facilitate input for the international Linear Collider Board. Anyone interested to participate is invited to register to the mailing list. Will you take part? The Linear Collider Board (LCB) is the central board committee for the Linear Collider Collaboration. To date, five European members from the directorates of CERN, DESY (Germany) and JINR (Russia) and two physicists from CNRS/IN2P3 (France) and PSI, Switzerland represent Europe. “Europe is a very specific region with dozens of funding agencies and much more labs. It is difficult for the five eminent LCB scientists to cover all the various aspects of the project going on here,” said Manfred Krammer, chair of the European Committee for Future Accelerators (ECFA) and former International Linear Collider Steering Committee member. Together with Joachim Mnich, Linear Collider Board member for DESY, Krammer has just set up the new European Linear Collider Forum to foster bidirectional communications between the scientific community and the five European Linear Collider board members. First invitations to join the forum were sent in January and already more than 80 scientists have subscribed to the mailing list. “The way this forum will operate is still work in progress, but our first attempt is to meet at least once before each Linear Collider Board meeting and once just after.” This way, the group can consult the LC board agenda, submit suggestions or questions and receive feedback after the LCB meeting. “There will be no decision taken during the forum meetings, but the information we will gather there will be priceless. Scientists want to know how the decisions are being made and why. This forum will try to answer these questions”. Krammer and Mnich hope the forum will prevent the LCB from being perceived as a remote body, far away from the scientists’ concerns. The information exchanged could be as diverse as scientific arguments, technical or even financial issues. 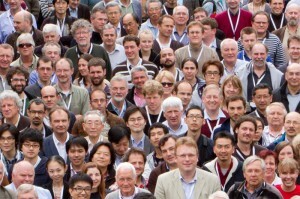 Both ILC and CLIC scientists are of course welcomed in this forum. “It is also important for us to gather the two communities in the same group,” said Krammer.